Three in One - new book! 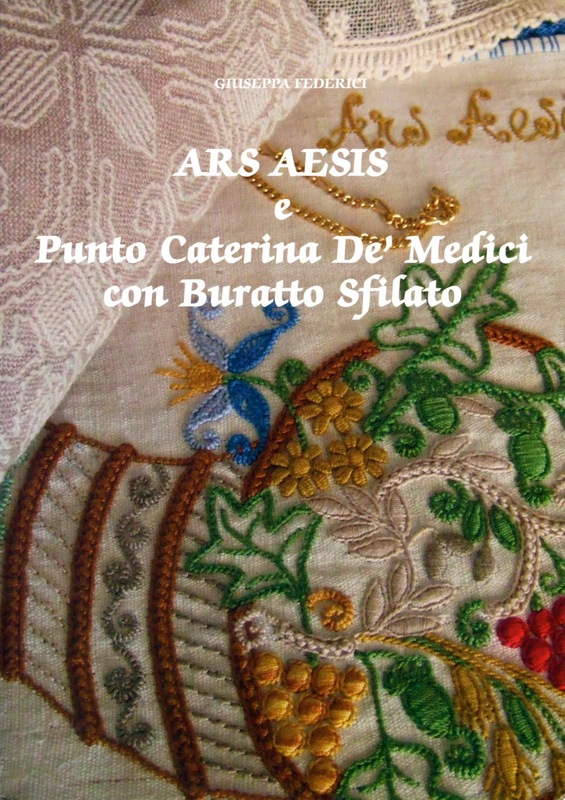 The latest book from Giuseppa Federici revisits three techniques: Ars Aesis, Catherine de'Medici Embroidery and Buratto drawn-thread work. 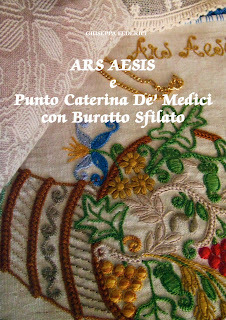 This volume is 64 pages beginning with a little bit of history on Catherine de'Medici Embroidery, then some background on Buratto drawn-thread work and some instructions on how to do it and the things you'll need in general followed by a small ornament project which is used to explain how to execute the withdrawn area and fill it with a motif done in the linen stitch. There are a good 7 pages of step-by-step photos so if you don't speak Italian, you'll still get it. Ornament embellishment and assembly finish this section. There are then seven projects combining Catherine de'Medici and Buratto drawn-thread work - some lovely border treatments here as well. After that are several pages of charted patterns for both techniques to be used with your own imagination to create other lovely things with the project of a small clasped purse to get you going. Commercial Buratto fabric is loosely woven evenweave linen with about 16-18 threads per inch so withdrawing threads to create a netted ground lends itself beautifully to larger design areas which are completed relatively quickly. It goes fabulously with Catherine de'Medici Embroidery creating delights of light and dark areas of design. 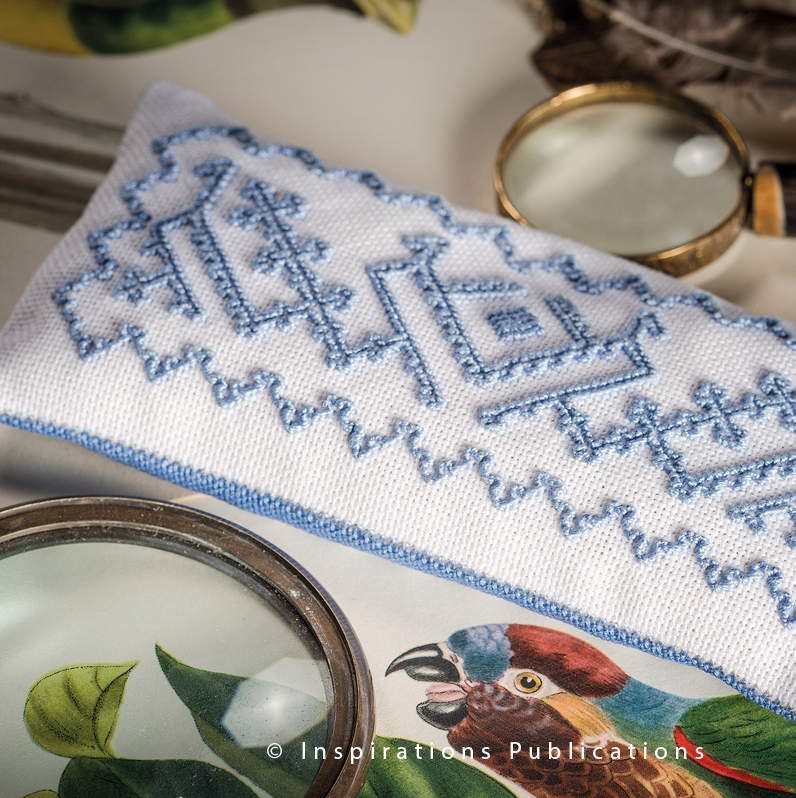 The final section is on Ars Aesis and here you'll find several pattern designs, projects, borders and edgings though you'll need her first book for detailed instructions on how to execute some of the needle lace edgings. Just so I've said it, the text is all in Italian. Ars Aesis uses no. 10 crochet cotton for thread which provides a different finish from pearl cotton. In Europe, both DMC and Anchor market quite a few colours in this type of thread (DMC Babylo no. 10 and Anchor Freccia no. 12) however I'm having some difficulty sourcing much on this side of the pond. If you know anywhere in North America which sells DMC Babylo no. 10 or Anchor Freccia no. 12 in anything other than white and ecru, would you leave a comment below? In Europe you can purchase this book by bank transfer directly from the author herself. Tombolo Disegni has it for those of us not in Europe, it can be found in the section of books with Catherine de'Medici Embroidery. From a private collection in Florence, since donated to the Salvatore Ferragamo Museum. 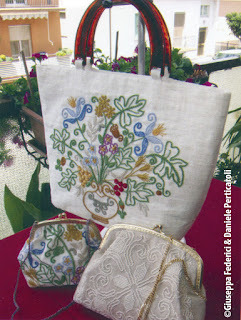 The following is an English version of my latest column in the Italian needlework magazine Giuliana Ricama issue no. 6. A couple of things to note: the Salvatore Ferragamo Museo in Florence gave me photos to include in the publication but I did not ask for permission to publish them here, so I do not include them with this translation. If you want to see them, obviously if you are in Italy you can get the magazine or go to the museum but you can also check out their website or you can explore the 20th century archives of the Ministry of Goods and Cultural Activities website. “There is no limit to beauty, no saturation point in design, no end to the materials a shoemaker may use to decorate his creations so that every woman may be shod like a princess and a princess may be shod like a fairy queen.” -- Shoemaker of Dreams. The Autobiography of Salvatore Ferragamo, London 1957, Italian edition 1971, edited by S. Ricci. 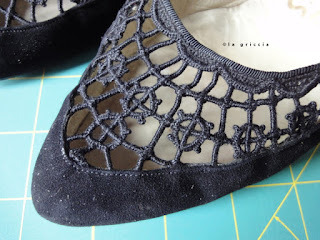 At the end of the 1920s Salvatore Ferragamo (1898-1960), known Italian fashion designer and founder of the fashion house of the same name, decided he wanted to use needle lace on a few models of his shoes. The nearby small towns of Tavarnelle, Mercatale and Greve, located between Florence and Siena, were centres of lace production in those days. Several models were created using the work done by local embroiderers in their own homes. Tavarnelle lace was used by Ferragamo again in the 1930s and 1950s and his big innovation was the use of colour in the needle lace. Some shoe models were called the Anna, Carina, Iride, Merletto and Sofia. Ferragamo shoe model from 1930-1932. Thanks to Mr. Ferragamo, the lacemakers of Tavarnelle embroidered for the most famous women of the day like Sophia Loren, Anna Magnani, Jacqueline Kennedy Onassis, Elisabeth Taylor, Audrey Hepburn and many more. 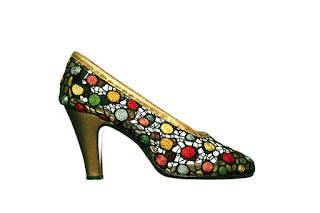 In the archives of the Salvatore Ferragamo Museum in Via Tornabuoni, Florence are models of shoes and sandals decorated with the lace of Tavarnelle but unfortunately nothing is displayed in the museum's permanent exhibition. You can however write to the museum and make an appointment to study them. 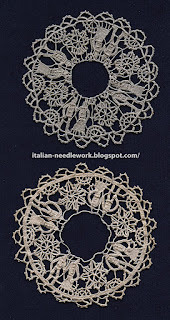 In 1906 a nun named Arcangela Banchelli arrived in Greve in Chianti and, being acquainted with the technique of needle lace, taught it to the students of the embroidery school which was one of the activities cared for by the Order of the Servants of Our Lady of Sorrows. 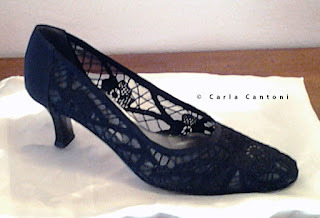 Over time, the fame of this lace arrived in Florence and very soon it was popular with the companies who created trousseaux. The first commissions came from them but soon commissions were also arriving from private individuals. 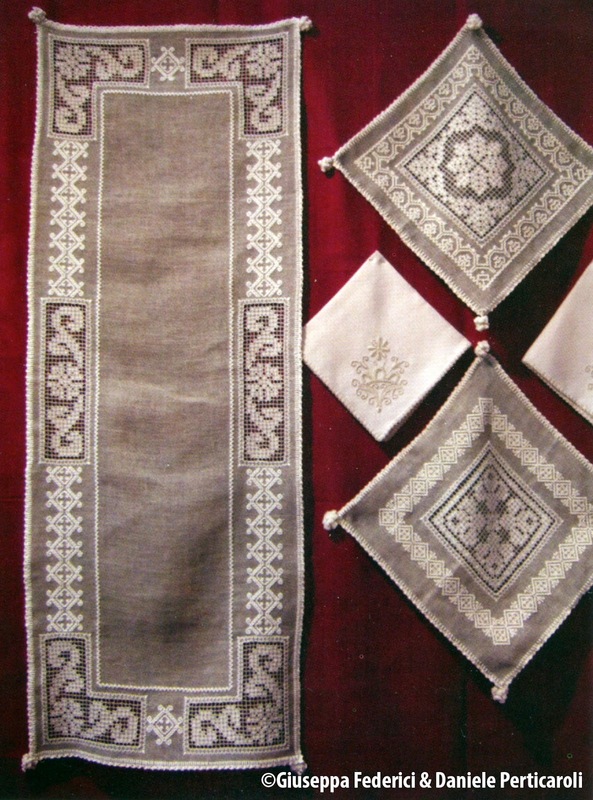 At one time every girl in the area had tablecloths, curtains and other household linen items in their trousseaux decorated with the lace of Tavarnelle. In the beginning the lace was quite complex but over time, due to the high commercial demand, it became more simplified in order to reduce production time. 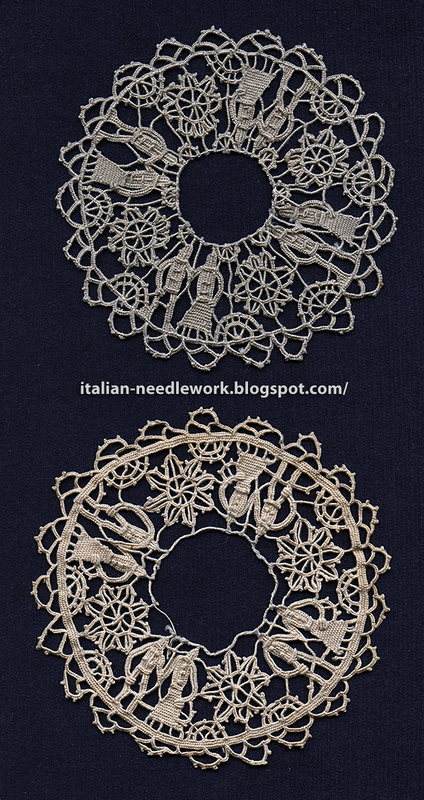 Two doilies of Tavarnelle lace from my collection. Tavarnelle lace derives from Venetian needle lace but has a technical preparation more similar to Aemilia Ars needle lace from Bologna. The design is drawn on wax paper which is placed on top of 5-6 layers of butcher paper and all layers are then basted together around the outer edge. Then support stitches are added to aid in the working of the lace. Typical motifs worked are geometric shapes, flowers and leaves, small animals, religious symbols, initials and the figures of a man and woman. After the work is finished, the support stitches are cut on the back side and the lace is removed from the support. Created for private use by Carla Cantoni, San Casciano Val di Pesa. These shoes were created using Ritorto Fiorentino pearl cotton no. 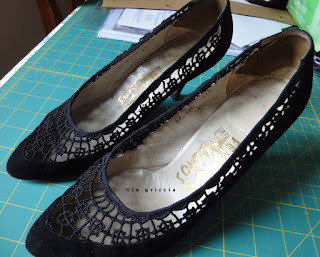 12 and took approximately 90-100 hours to create the lace. Aren't they lovely? 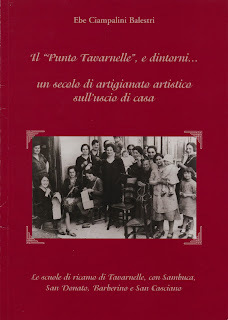 In 2002 Ebe Ciampalini Balestri published a small volume (in Italian) on this technique called: Il "Punto Tavarnelle", e dintorni... It is still available direct from the Pro Loco di Tavarnelle tel: 055 8077832. Thank you very much to Blandina for the use of her photos of her mother's shoes which she donated to the Salvatore Ferragamo Museum and to Carla for the photos of the lovely shoes that she made for herself. The new edition (#87) of Inspirations magazine is out and nestled amongst all the lovely projects you'll find a book weight project done in Punt'e nù embroidery from Teulada, Italy. 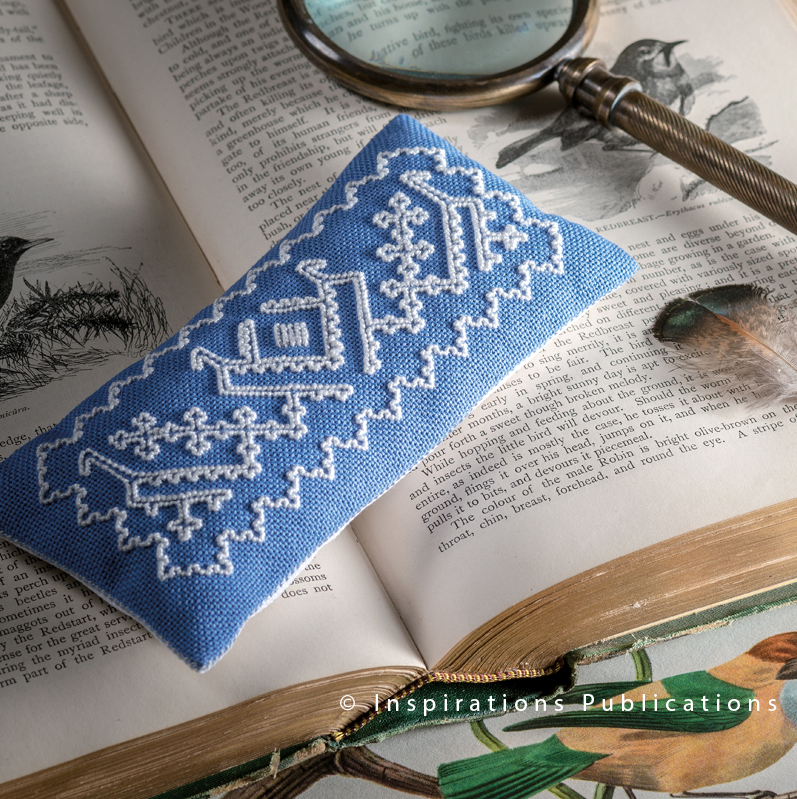 While a book weight is a break from traditional use for this embroidery, the pattern is authentic and features a pair of cockerels back-to-back with an almond motif between them. The pattern also features the pomegranate motif and the teeth border. You can use a book weight to keep your pattern books open when stitching or to keep your embroidery frame on a table while you work on an area that hangs out over the edge. They make great gifts and are a nice size for experiencing a small sample of Punt'e nù embroidery! 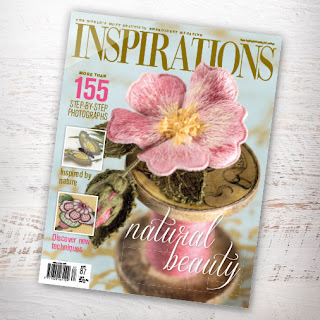 Also in this issue of Inspirations is a lovely review of the English version of the book Sardinian Knot Stitch. 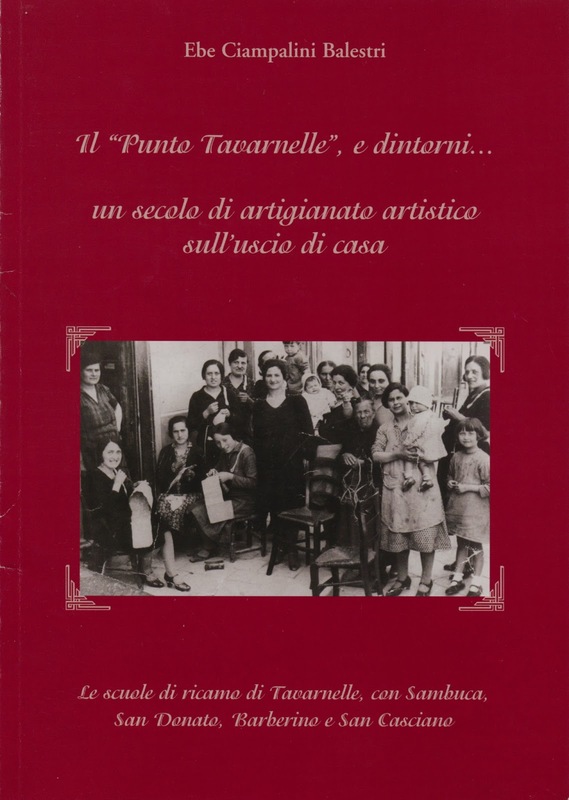 This book is also available in an Italian version. Both books are available through Amazon. Thank you Inspirations for doing such a beautiful layout for this little project!